One hundred and forty-three years ago today, they were probably a little nervous. Perhaps a little scared. Certainly more than just a little excited. Perhaps more than a little apprehensive. He was just 20 years old in November of 1869, she was only a little older, and they were getting ready to begin their life together the very next day, the 25th of November 1869. The marriage was performed by John Dickson, a justice of the peace in Etowah County, Alabama, and William Washington Shew and Nancy Elizabeth Allen were pronounced husband and wife — a marriage that would last more than 57 years, until William’s death in Milam County, Texas, in March of 1927. 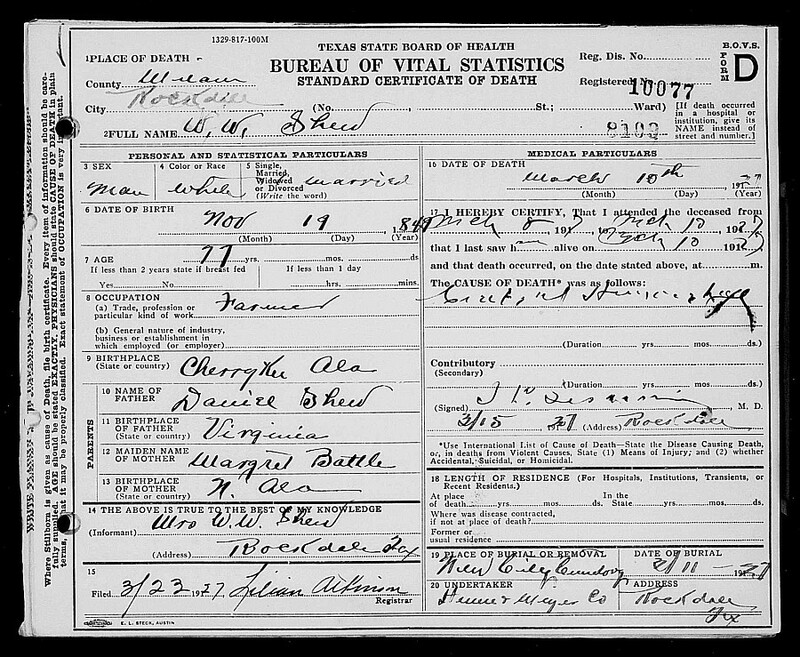 William was the oldest child of Daniel and Margaret (Battles) Shew, my third great grandparents. His only sister, Martha Louise (Shew) Baird Livingston, was my second great grandmother. And I would absolutely love to touch base with some of William and Nancy Elizabeth (Allen) Shew’s grandchildren or great grandchildren to find out more about this branch of the family. Names. Dates. Places. What I call the Begats. But family history is, or should be, so much more. And there is so much more I would like to know about this branch of my family tree. We have only a few more details about William’s life. We believe he was a minister of the Gospel. 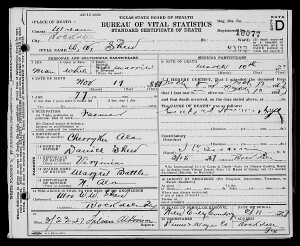 His name appears as the officiating minister in an index of marriage records in Alabama in the 1880s.13 We know he was a farmer in Texas, or so the census records say. But there is so much we don’t know about this branch of the family. Why did William and Nancy Elizabeth move to Texas? Did William serve as a minister at all after the move? Are there records in this branch of the family to tie them more closely to my branch? What can their oral family tradition add to mine about William’s and Martha Louisa’s parents and grandparents and great grandparents? And, of course, what does their genetic heritage add to the genetic heritage of my branch to paint a clearer picture of our shared ancestry? I have an already-paid-for DNA kit that’s burning a hole in my pocket… and I’d love to touch base with a grandchild of William and Nancy Elizabeth or even a great grandchild (though a grandchild would be better) who’d be willing to test and help nail down our common ancestry by way of DNA. I’ve sent the link for this page to http://groups.yahoo.com/group/ShewFamilyGenealogy/. We have quite a few members that are from Alabama & Texas. I hope you make a connection. My Shew family is from NC. Good luck! I am the grandaughter of John Shew. I have information on some of the Shew’s if anyone is interested. Simon Shew married Sarah this is John Shew’s grandparents. John’s father is William Henry Shew. I am a cousin…Joni Shew was my great grandma! Nice to “meet” you, cousin! Nice to meet you!!! This is freaking awesome. My sister Joan was named after great grandma!